Artist and Buddhist practitioner Cynthia Jurs, is bringing Earth Treasure Vases to places around the world that need to be healed and remembered, in an act of extraordinary dedication and beauty. Her practice with the Vases has gone on for many years, and is a rare ritual practice that is an offering of feminine energy in our imperiled world. 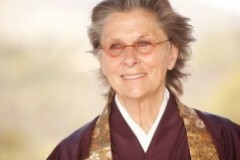 Roshi Joan Halifax is a Zen teacher, author and founder of Upaya Zen Center. She is an Alliance for the Earth Advisor and has been supporting the Earth Treasure Vase Practice for many years. The Earth Treasure Vase is a spiritual practice that truly invites peace into the broken, wounded areas of our troubled planet. How does it happen? What is the magic? It happens because the practice demands that us humans also become vessels for healing. As the community gathers and pours prayers, gifts, relics, songs, hope into the vessel, the same occurs on the human level. As we also become the carriers of the prayers, become earth treasure vases, then we too may have the capacity to ease suffering where it is most extreme but without being infected by it. Spiritual intent, focus, and devotion are the instruments of this work. When I was present at an Earth Treasure Vase full moon meditation at Open Way Sangha, a woman placed a diamond ring in the vase meant for Liberia, West Africa. She was making amends for the terrible suffering associated with diamond mining in that area. This was not an easy gift to offer. The ring had been her mother’s. The sacrifice she made added to the vase’s potential for bringing peace. What else is required? An open and broken heart. A willingness to see the grave suffering around us and to bring whatever we can to ease it. Also a belief in the old, old wisdom ways that teach that we can invoke spirit and the deities to be alongside us in this quest. I am, for a short time, the custodian of the Earth Treasure Vase designated for West Africa. I awaken it often by ringing a bell. The bell awakens me, of course. In such mutuality, peace enters our lives. 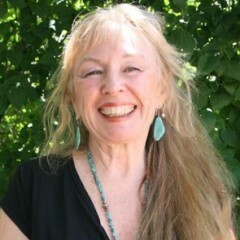 Deena Metzger is a writer and healer and an Alliance for the Earth Advisor. We are living in a time of emerging planetary consciousness and the need for every person to become an intelligent steward of our earth’s biosphere. Meaning is no longer limited to the boundaries of our homes or our country, but encompasses people everywhere and embraces life in the remotest of places. This is a time of change; a time of urgency; a time to come together around the world as one people; a time to be responsible for our biosphere. Cynthia Jurs’ long journey with 30 earthen vases, given to her by lamas in Nepal, is a heartening story about one person’s life-long dedication to master the timeless practice of a Tibetan Buddhist ritual for the purpose of healing the biosphere. 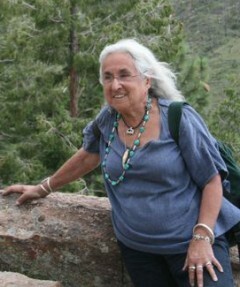 Her story is similar to that of other elders who have dedicated their life to a larger purpose and who have sat in prayer to help heal the earth and bring peace to social crisis. Although the practice of this vase ceremony is handed down from Tibet, many cultures have symbolic rituals around earthenware pots. Through the sacred offerings made to the vase and the joining of community in prayer, a sacred intention is created. The vases are filled with meaning and the act of healing and nurturing is given life and held within the body of the vase. The circle of humans who are its inspiration are also the witness to its first breath. The practice of this ancient Tibetan tradition has transcended its original culture. These vases represent a “universal” vessel — a vessel that can contain something precious, whether it is a wish, a dream, or a people. These vases represent challenges we live with today. They have become messengers for these places and its people. They give us the opportunity to join the journey and step into the possibility that we are intelligent participants in the future of our biosphere and a larger planetary society. By paying attention we can make a difference in the outcome. I have been graced with the opportunity to be a steward for two of these vases: one dedicated to healing the biosphere and another to healing the oceans. In both cases, the journey with the vase helped process my own sorrow and pain about the challenges we face. Through the formulation of prayer and gathering with friends and allies, the challenges became bearable and lightened. A film about Cynthia and the story of these vases needs to be told. Each vase embodies a story that is important. Each vase carries meaning for the world to hear. Each vase brings together people who sit together in communion and others, wherever they may be, who will be included in the story upon hearing of its cause. A film about Cynthia and the vases will enable people around the world to get involved with the process, the history of each vase and the prayers they hold. May it be so. Gaie Alling, is co-founder & president of the Biosphere Foundation & The Planetary Coral Reef Foundation and helped bury the Ocean Treasure Vase and the Biosphere 2 Earth Treasure Vase. 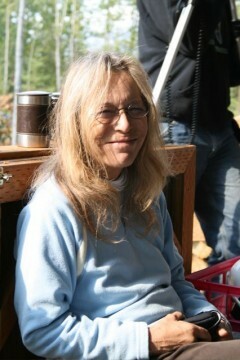 The first time I went to an Earth Treasure Vase ceremony at Open Way Sangha with Cynthia Jurs, was many years ago. I was moved to return again and again to the monthly full moon ceremony. After a short, guided meditation the clay vase from Nepal is opened and passed around the circle so that each person can deposit a gift into it. Some sing, some leave a tear or two; some bring a pinch of earth from a sacred land. Some drop a family ring or a tiny origami crane. The vase is heavy with intention for healing the place where it will eventually be buried, deep inside the Earth. This is an ancient Tibetan tradition, to fill a vessel with prayers for the healing and protection for the earth. I have watched Cynthia for at least ten years (she has been doing these ceremonies for 20 years) invite and gather people to participate in this ritual. I have become increasingly aware of the arrogance with which we treat the Earth, our only home. I have given much heartfelt thought to what I can do as a human being to help regenerate the thin skin we live on. I think of the planet as a giant whale, benevolent enough to let us live on her body like colonies of barnacles. The answer I have come up with is Ritual and Ceremony. One of these is the Earth Treasure Vase Ceremony. It is an attempt at direct dialogue with the living Earth. To try to let her know, that some of us, feel immense gratitude for her hospitality. In 2008 I went to Alaska with Cynthia and a small group to bury one of the pregnant (with intention) vases close to the Arctic Circle. We were received and guided by Evon Peter, his Mother Adeline, his brother Odin, and his sister Princess, a family from Arctic Village. Together in song and prayer we buried the vase in a plain amongst summer flowers, deep green soft lichen and wild blueberry patches. My fervent intention was for the ANWAR region to be protected. That the plan for drilling in that region be stopped so that the way of life of my brothers and sisters of the Gwitch’in nation be respected and preserved. Also I prayed to the Earth that Barack Obama be elected. A few days after we got back home from the pilgrimage John McCain made the crucial mistake of asking Sarah Palin to run on his ticket. As I saw this develop on television, I became convinced that the spotlight on Alaska would be a good thing. Indeed the plans for drilling have, for now, been put on hold. Also I knew that his decision would help in the election of Barack Obama to the Presidency. Ritual works. It is the strongest tool we have against destruction and greed. Dialoguing with the Earth like the Shamans of old is the most powerful way we have to show our participation with our precious habitat. A small gesture like the filling and burial of a vase from the Tibetan tradition can indeed convey our intentions to the heart and soul of the earth. Please join me and the many others who have been touched by this practice in giving prayers, intentions and your financial support to this ongoing ritual, stewarded by Cynthia Jurs. 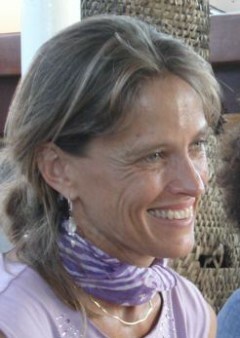 Joanna Harcourt Smith has interviewed hundreds of planetary visionaries for her podcasts on www.futureprimitive.org Joanna has been a part of Open Way Sangha for many years and helped to bury the Earth Treasure Vase in Arctic Alaska. The Earth Treasure Vases are prayers for the healing of the earth that has been so damaged by our greed and short-sightedness. I feel that when a vase is buried, the intent and thoughts of each person who has put sacred objects or breathed their prayers into the vase, seeps out into the earth, maturing and spreading the vibrations of goodwill and love through the months and years to come. We are so blessed to have this vehicle offered with dedication by Cynthia Jurs and the Lamas who made these vases with sacred earth and prayers. Vijali Hamilton is the Founding Director of the World Wheel Project: Global Peace & Healing Through the Arts and an Alliance for the Earth Advisory Council member. She buried the vase in the Amazon.